Our planet has approximately 327,000 miles of coastlines, and its oceans contain about 366,520,000,000,000,000,000 gallons of water, yet across that vast expanse trash and other harmful materials from individuals, businesses and industries have been accumulating for a century if not more. 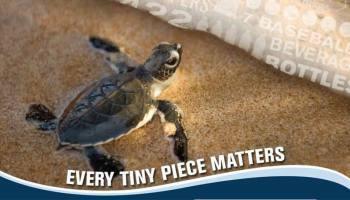 That’s why the Ocean Conservancy’s International Coastal Cleanup Day really is about more than a single day. It’s about advancing the organization’s mission to harness the “power of one to fight ocean trash,” and how much can be accomplished—not only in terms of cleaner oceans but the overall health and conservation of all water resources—when individual actions add up! The Ocean Conservancy’s twenty-one page 2017 International Coastal Cleanup Report does an amazing job at demonstrating the impact this approach is making on cleaning up global water pollution. In fact, I find the report so convincing and motivating, I’d be okay if you stop reading this blog right now and delve into that report instead! More than 504,583 volunteers from 112 countries got involved worldwide to help clean up ocean trash. Volunteers cleaned up a total distance of coastline equating to two walks around the moon (14,977 miles). More than 18.3 million pounds of trash was collected. Enough cigarette lighters were collected to span 10 times the height of the Eiffel Tower. The quantity of beverage cans collected weighed as much as a safari Jeep. And in the category of “weird finds” collectors cleaned up 56 toilets, 8 microwaves, a piano and, yes, a blender in Jamaica (the shaker of salt is apparently still missing)! 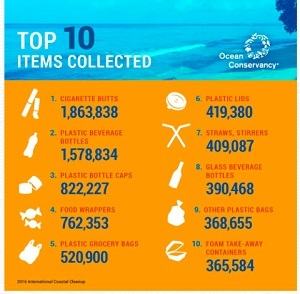 As you can see, person by person, coastal cleanup efforts are making significant progress! But, you may ask, “what can I do living here in Inland City, USA?” Plenty! All water quality and conservation efforts—such as protecting and restoring wetlands—contribute to the “global whole,” and you can collaborate with those around you to find, as well as make, opportunities to do our part. Just look around you… on the website pages of local government, conservation organization or your water service provider… and you’re sure to find ways to support efforts contributing to the ultimate goal of International Coastal Cleanup, protecting our planet’s most precious natural resource. If you’ve reached the end of this blog, I encourage you to now go back and read the 2017 International Coastal Cleanup Report, look around locally for opportunities to get involved, and remember that great progress comes from individual efforts working together!